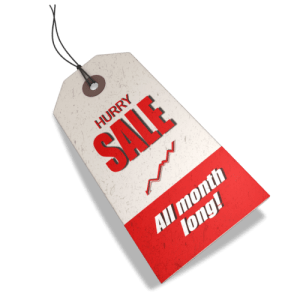 Black Friday Sale all month long in October? “Black Friday Sale all Month Long”. Last time I heard, “Black Friday” was the day after Thanksgiving and if you are in the US that means latter part of November. Really, a sale for that long? Can anyone take you seriously? Do you even have a sale? Well, there is oodles of time to check out your competition. Probably even buy from them because your advertising screams, going out of business. Will you even remain in business to honor any purchase I might make? I have no faith in your product or service when you appear begging for business. Scarcity makes a feeding frenzy of the public. A business needs to imply their product as limited and if you want a deal, you need to act before it is too late. If you give the public all the time in the world to make a decision, they will not make one.